YFWOOD wooden bow ties are made from real wood and 100% linen or cotton centerpiece. Each wooden bow tie is unique and the grain and colors may vary slightly from tie to tie. 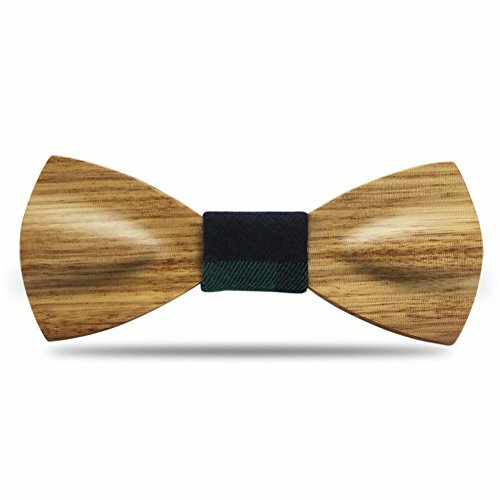 Each wooden bow ties is made from 100% natural wood,handcrafted and unique. The wood is real zebra wood,no paint and no chemical. This wooden bow ties is apply to any suit,suitable for weddings,performances,parties and even everyday use. This fashion accessories Pre tied bow ties can be used as a birthday gift,Fathers Day Gift,Valentines day gift or wedding bow ties for groomsmen. The Zebra Wood Bowties packed in a gift box,you can send to your friends and lovers. WOOD BOW TIES for men are the perfect accessories to make your formal wear inimitable. Wear this wooden bow ties to your friend's wedding and you'll receive compliments from all the bridesmaids. Our wood and cotton fabric centerpiece works perfectly with any suit for every proper occasion. Try our wooden bow ties and if you don't like them,we will give you your money back.Add to Cart Button NOW. Natural Material:100% Natural Eco-friendly wood products will show your elegance and individuality.Each zebra bow tie is handcrafted and unique. Features:High Quality Wooden Bow Ties with 2 Pieces Different Color Fabric Centerpiece to replace,to match your different suits.Note:2 Pieces fabric one is a fixed Green plaid cotton cloth, and the other one is a random matching, from grey plaid, white plaid to black with white spots cotton cloth. Perfect For Any Occasion:This Pre tied wooden bowties is great for formal events,weddings,parties etc.Perfect for daily/performance/party/photo wear and easy to take off or wear!A must have for man's wardrobe goods! Great Unique Gift:This fashion accessories pre tied bowtie can be used as a birthday gift, gift for men, gift for father or wedding bow tie for groomsmen. The Length of Belt can be adjusted depending on EVERYONE SIZE.Therefore,Don't worry the size problem. Pocket Squares Holder For Men, Best Accessories for Suits, Tuxedos,Vests and Dinner Jackets, 5Pack Assorted.